The word death in the title of a children’s show may well seem out of place, but let this not deter you from giving this story a chance. It is after all based on a book which, when it came out in Germany in 2007, became a critically acclaimed best seller. Working in the best of his country’s tradition, the writer and illustrator Wolf Erlbruch evidently believes in a no holds barred approach to children’s literature, and this bears results too. He is also the illustrator of a now well known children’s story The Mole Who Knew It Was None of His Business which deals with the sometimes difficult and yet inevitable subject of faeces. 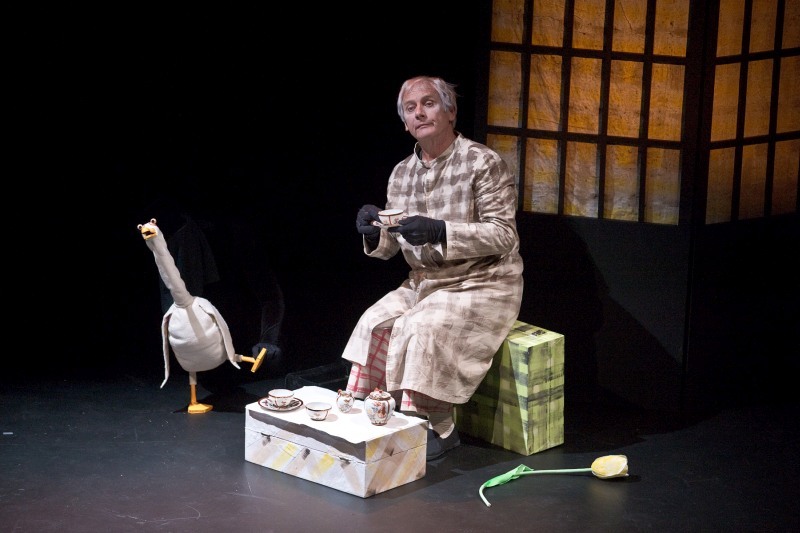 Duck, Death and the Tulip was initially published in English by a New Zealand publisher and is brought to Edinburgh by the Wellington theatre company Little Dog Barking, founded by performer and director Peter Wilson. Wilson plays Death and puppeteers together with Shona McNeil in this simple but well defined production directed by Nina Nawalowalo. Judging by the episodic narrative flow, the piece seems to follow the prose version very closely which does not always work in its favour dramaturgically, but Gareth Farr’s subtle musical score helps to keep us suitably engaged throughout. Modelled on the original illustrations, the puppets too are simple and stark yet entirely heart-warming in their interactions with each other and the visual world they are a part of. Even if he didn’t get any of the philosophical content of the story, my seven month old was immediately captivated by the rising sun against the black backdrop, he loved the protagonists frolicking in the pond, and like all of us he too seemed swept up by the story’s theatrically effective finale – of a duck floating away in the silky river of eternity. Older children too would probably respond well to occasional humour and the more complex narrative content dealing with the natural life-death cycle. And here’s of course an ideal opportunity to deal with their questions about death without the painful context of losing a pet or a family member. I wished for a bit more audience interaction and a slightly more playful approach to the piece. A close adherence to the text made this difficult, as did as the fact that the only character played by an actor was Death itself. I fear the theatre version of the story loses more than it gains from this approach, but if it intrigues you to buy the book, as it has done for me, it has had some sort of a lasting effect after all. Duška Radosavljević is a dramaturg, writer and lecturer in Drama and Theatre Studies at the University of Kent. She is the author of Theatre-Making: Interplay Between Text and Performance in the 21st Century (2013) and editor of The Contemporary Ensemble: Interviews with Theatre-Makers (2013). She also writes for The Stage newspaper and Exeunt magazine.